She didn't even get 33% of the vote—432-202. Told you earlier she had no hope. According to The Guardian, it's the largest defeat of the governing party in a parliamentary vote, topping by around 80 votes one involving Ramsay Macdonald's govt. Ramsay Macdonald: what a melt. I don't imagine Corbyn's no confidence vote will pass, unfortunately. But possessor of fine prime ministerial moustache. There must have been a dozen different soups that he couldn't safely eat. You wouldn't want to argue with him after he had broccoli and stilton for lunch. I'd rather get between Churchill and a bottle of brandy. If you were a fan of Derek and Clive you might not be so cavalier. To explain : Peter Cook and Duddley Moore had a sketch called "Worst job I ever had" the first being where they had to collect lobsters from Jane Mansfield's bum. The second where they had to collect all of Winston Churchill's bogies after he had smoked all his cigars. Anything related to Churchill's material satisfaction would be several bridges too far for me. 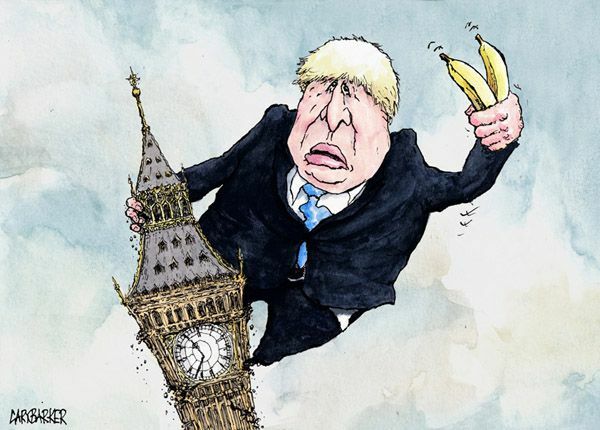 And here comes the affectedly shambling figure of Boris Johnson – not so much a statesman as an Oxfam donation bag torn open by a fox – who could conceivably still end up prime minister of no-deal Britain. Let's hope he gets shot down also.